Ancient and sacred, Stonehenge is one of the most famous sights in the world. It is said that imitation is the highest form of flattery and Stonehenge has received a lot of it. There are replicas built to the same dimensions as the original, some even astrologically aligned to the summer solstice just as the original is. We decided to have a little fun here at OpenJourney.com and have complied a list of some of the more unusual Stonehenge replicas. 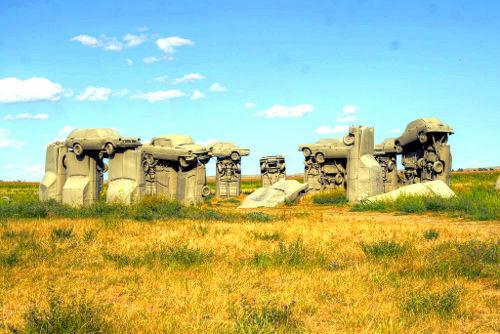 From cars to port-a-potties to sticks of butter, check out these wild and wacky clonehenges. 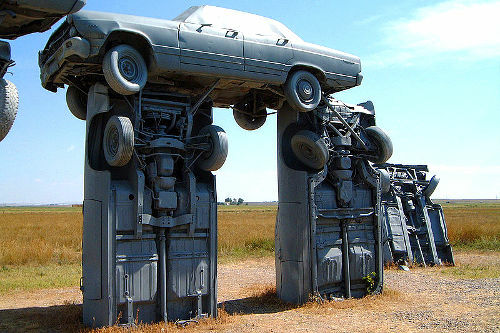 Although Carhenge was constructed with materials very different from those of Stonehenge, creator Jim Reinders stayed true to the dimensions of the original. 38 American vintage cars from the 1950’s and 60’s were used to represent the 38 major stones and the cars were spray painted gray. The heel stone is a 1962 Cadillac. Carhenge was listed in the 2007 edition of “1,000 Places to See in the USA and Canada Before You Die.” Carhenge was built as a memorial to Reinders’ father and was dedicated on the summer solstice in 1987. It sits outside Alliance, Nebraska. Loohenge artist Banksy speaks honestly about his creation. 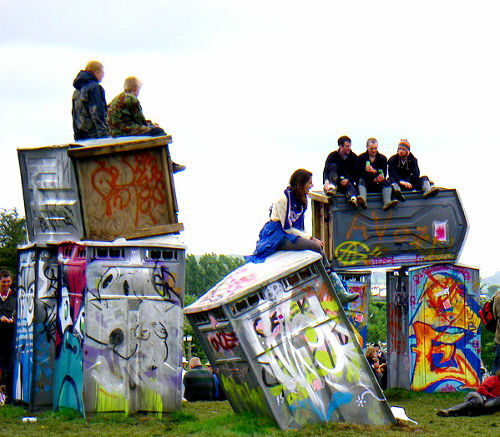 “A lot of monuments are a bit rubbish,” he says “but this really is a pile of crap.” Loohenge stood at Britain’s 2007 Glastonbury music festival and was controversially located in the “Sacred Cicle”. 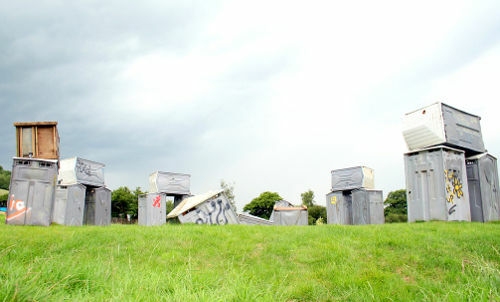 It was erected using plastic port-a-potties, with a sawed in half a portable toilet sunk into the ground as the alter. 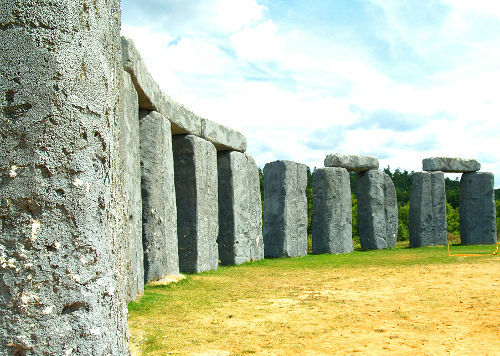 One of the world’s most photographed Stonehenge replicas, Foamhenge started as 16 foot tall blocks of Styrofoam. Artist Mark Cline worked diligently to sculpt the blocks into to the same shape and sizes as the original stones. The foam blocks are firmly anchored in so that they don’t blow away, as Cline's first Foamhenge did. Erected in one day, Foamhenge took a little less time to build than Stonehenge but, as Cline says, "Styrofoam is non-biodegradable. 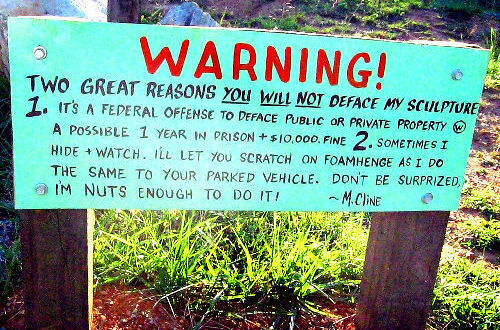 Foamhenge might last longer than the original." It also holds the record for the fastest Stonehenge ever built. 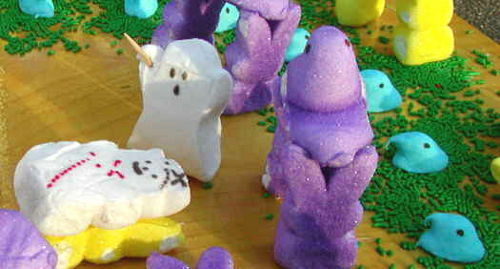 PeepHenge - the sacred circle of the mysterious (and delicious) Peeps. 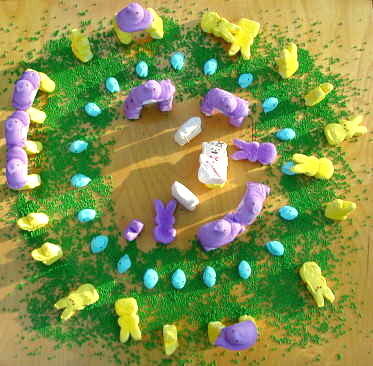 Made with a varriety of seasonal Peeps and green sprinkles, this is by far the tastiest clonehenge we've come aross. An article on wild and wacky Stonehenge replica's would not be complete without one made of butter. It just seems to make sense - the sticks are about the same shape as the original stones and they are small enough that a replica could be erected anywhere. 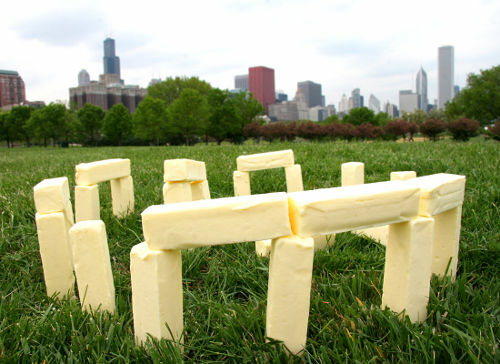 Artist David Prince built his Butterhenge in Chicago's Grant Park in the shadow of the city's skyline. Visitor's to England's Legoland are treated to a variety of famous sights and landmarks, all made from Legos. Legohenge is Legoland's version of Stonehenge and is a pretty impressive replica. 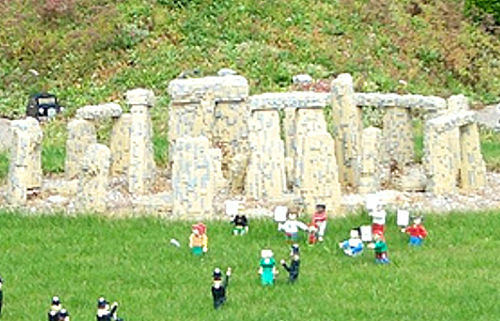 Lego has not left out Stonehenge's history of protests. Notice the protesters and police officers (bobbies) - all also built from Legos - in front of Legohenge. Poem Henge was installed in Belmar, New Jersey by the Belmar Arts Council for the 2005 Autumnal equinox. 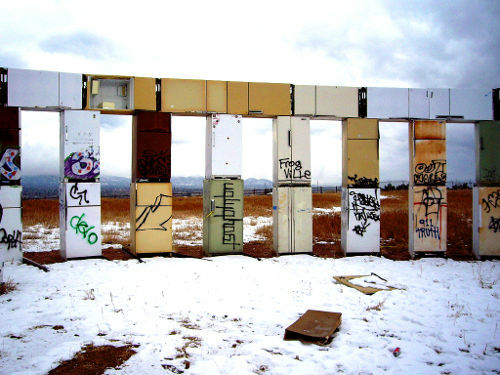 36 discarded refrigerator doors were used to create a Stonehenge replica. 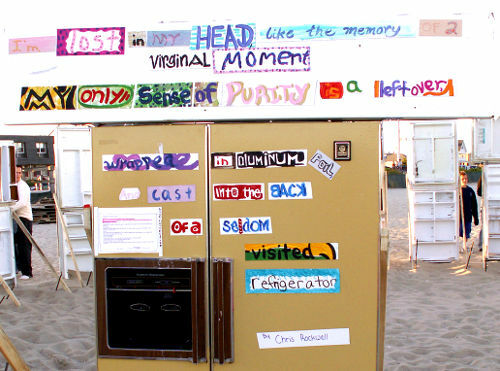 Poetry was painted on to magnets by local artists and students and were then arranged on the doors. 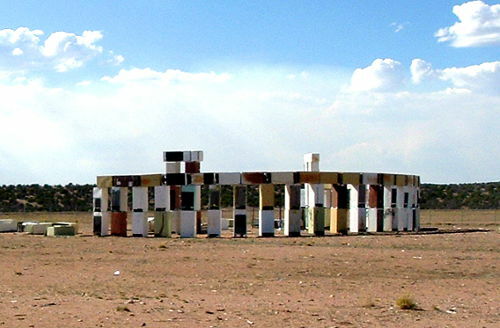 Stonefridge sat outside Santa Fe for nearly 10 years before it was dismantled in 2007. The artist, Adam Horowitz, was inspired to build Stonefridge after seeing all the appliances in the local landfill. It stood as a testament to America’s waste as well as in response to the creation of the Atomic bomb. It was built within sight of the Los Alamos National Laboratories where the atomic bomb was born. We could not write about Stonehenge replicas without including the infamous 18 inch Spinal Tap model. In the movie "This is Spinal Tap", the fictional hairband Spinal Tap find themselves onstage with a less than impressive Stonehenge. 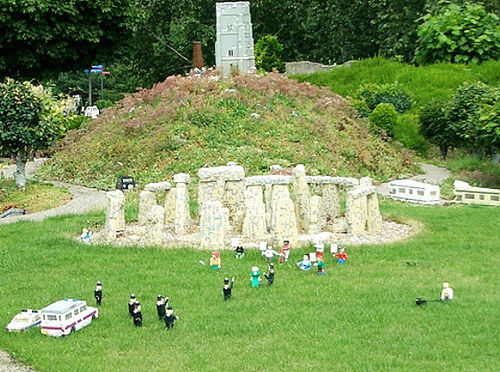 There are more wild and wacky Stonehenge replicas than we could ever feature in one article. So, for more information on creative and fun clonehenges, check out Clonehenge.